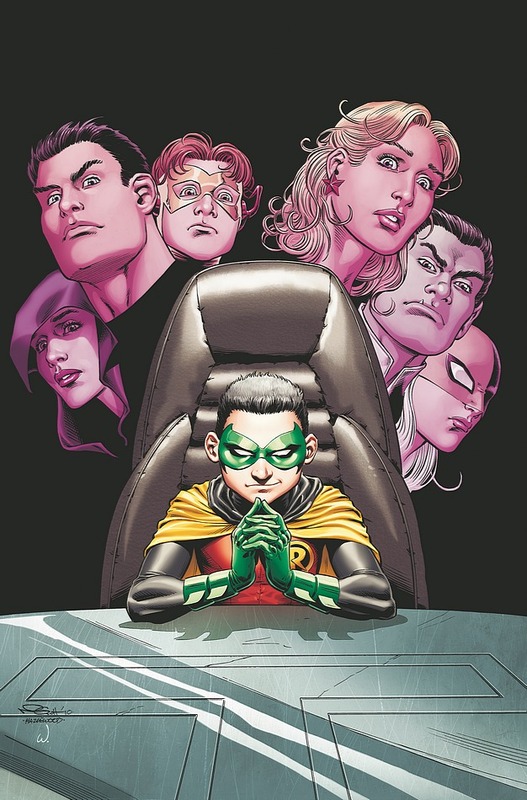 Teen Titans #88 kicks off with the new creative team of J.T. Krul and Nicola Scott. The Teen Titans, hmm? I’ve never read an issue of Teen Titans in my life, mainly because I’ve never had a real interest in any of the characters. A lesser form of the Justice League … a JLA in training … a group of kids. Something about that just doesn’t work for me, but then, I’ve never exactly given it a chance to. Why take Nightwing and Donna Troy when you could have Batman and Wonder Woman? Not that I don’t like Nightwing, sure, but the Teen Titans have always felt “not as good” to me—and, at the end of the day, that’s basically what it’s all about, right? That being said, there were a few things that made me want to, at the very least, check out issue #88 of this title. For one thing, Nicola Scott’s doing the artwork now, and I have something of a fondness for her stuff—and happily, she knocks it out of the park. On the other hand, while I wasn’t exactly champing at the bit for J.T. Krul’s writing (Green Arrow isn’t impressing me), I took a look at the character cast—well, specifically, I took a look at the inclusion of Damian Wayne—and thought, okay, I’ll give. He’s bound to make this interesting. Let’s see what this book’s got. I can’t say I’m hooked yet. Not in the sense that I’m desperately gasping for the next issue, like it’s a breath of air, the way I do for Birds of Prey, or X-Men Legacy, or the next Fables trade. But, I’m definitely along for at least a bit of a ride. The issue opens with the narrator describing an outcast high school boy who has no friends, no real family, and therefore “perfect” for whatever horrible plan the villain of this arc has in store for him. Kind of a weak beginning, and a little too cliché for my taste. This plot gets built more later on, but first, and more importantly, the scene cuts to the Teen Titans—Wonder Girl, Kid Flash, Raven, Beast Boy, Ravager, and the newly-returned Superboy—fighting a “vampiresque” attack out in the city. 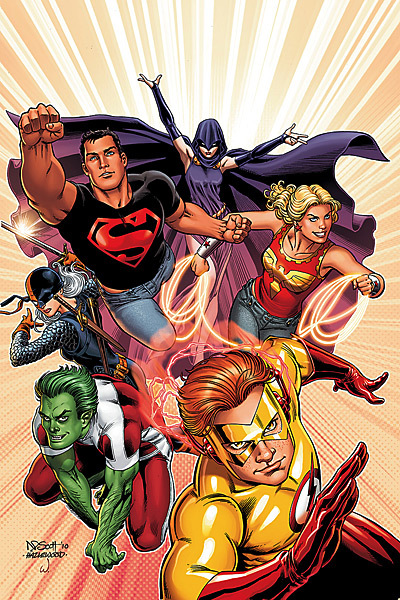 The interplay amongst the team members during this battle sets the tone of the book, along with some pretty solid expectations once the fight ends and the group heads back to Titans Tower, where Wonder Girl expresses to Conner that her worry over his wellbeing is a handicap on her leadership ability in the field. There are further hints of what’s ahead for the Titans, particularly in regard to Ravager and Raven, and a teaser image at the end of the issue just solidifies what the reader is already guessing will happen. The best part of this issue, though, is where Robin comes to play. I don’t want to spoil what is a really fun scene and more or less what I hoped for when I decided to give this book a read. Damian Wayne is easily one of the most interesting and complex characters in recent history, and I think his part here alone is what will keep me involved going forward. Let’s see if Krul has the talent to continue to foster what Grant Morrison has done with the character. All things considered, this issue wasn’t a bad beginning for the new creative team. Here’s my send-off: a look at a gorgeous Nicola Scott rendition of the group and cover for #89. This entry was posted on 11/05/2010 by ravenhaired. It was filed under Comic books, Reviews and was tagged with Damian Wayne, DC, J.T. Krul, Nicola Scott, Titans.